Canine Autoimmune Thyroiditis is a genetic disease which is the cause of over half the cases of hypothyroidism diagnosed in dogs. While just one individual symptom may not alert a veterinarian to this significant genetic problem, a combination of the symptoms should signal the need to test for autoimmune thyroiditis and thyroid function. Hypothyroidism is not considered to be a life-threatening disease. However, the quality of life of an animal suffering from hypo-thyroidism is substandard. The most common clinical symptoms of canine autoimmune thyroiditis are; sluggishness, obesity, skin disease, cold intolerance, hair loss, weakness, poor coat and infertility. 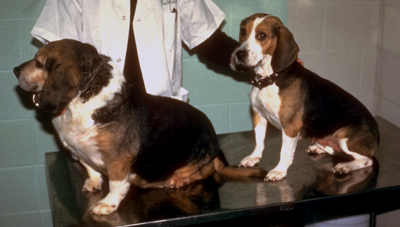 On the left is a beagle with hypothyroidism, on the right is a normal beagle. The incidence of autoimmune thyroiditis in males and females is similar. Dogs with autoimmune thyroiditis produce antibodies against the storage form of thyroid hormone. These antibodies are present in the dog's bloodstream, so a simple blood test is all that is needed for accurate diagnosis.